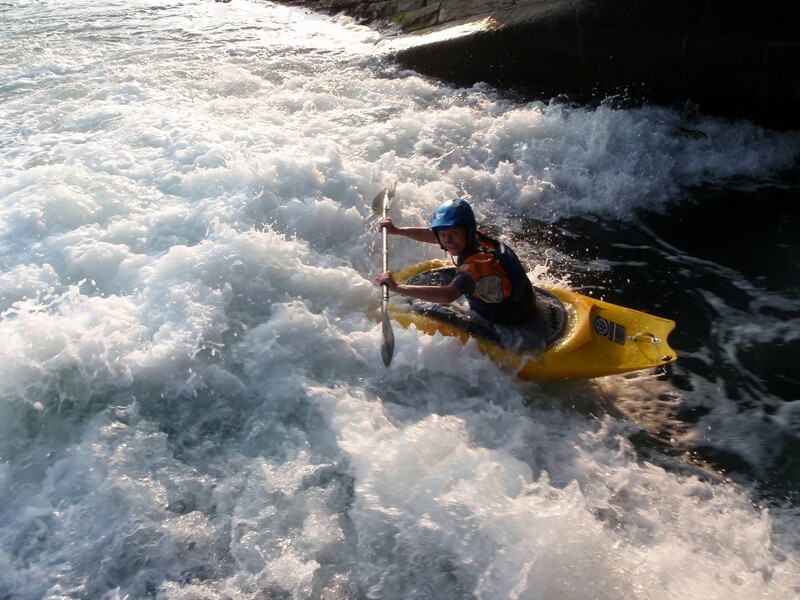 A dynamic stroke is where the kayaker moves the paddle to make the kayak go through the water and a static stroke is where the paddle is just placed in the water and held there while the movement of the boat (while at speed) does the turning action. 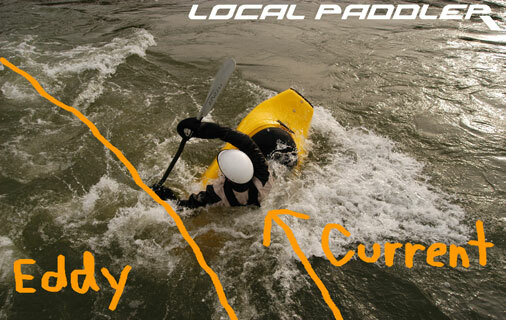 At Three Star level a paddler should be able to perform a very efficient deep water rescue. Although no specific time scale is mention in the syllabus, we would suggest that a good time to aim for is to have the paddler back in their boat in less than a minute after they capsized. It is recommended that boats are fully fitted out with airbags to assist in this. 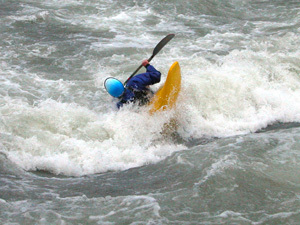 Trapped Paddler Rescue or "Hand of God"
Loop, Ender or Endo Two consecutive ends over 70 degrees from bow to stern where the boat remains facing the direction of the water flow, starting and finishing facing upstream. The boat does not touch the water at one point of the execution (air loop). Airwheel / Space Godzilla An aerial loop with a 90º rotation between ends. Both ends must be over 70º. Tricky Wuu A three ended sequence performed using one paddle blade only. - two ends must be over 70 degrees and the other over 45 degrees. The first end is initiated on the bow one way. The second tail end is split back and rotated through 180 degrees. The third bow end is followed through in the same direction as the first. 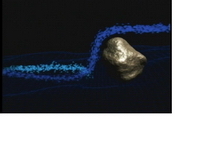 Orbit or Lunar Orbit Stern pirouette elevated over 70 degrees, initiated from a front surf. Move may finish as a 360 pirouette ending in a front surf (orbit), a 270 pirouette ending in a bow cartwheel end, or a 180 pirouette ending in a back loop (lunar orbit). Phonix Monkey a cross-bow 360 degree pirouette elevated at 30 degrees minimum and followed by a front loop. Onlyone paddle stroke must be used to achieve the move. Flat Spin 360-degree rotation of the boat at a 0-45 degree angle retaining the feature. Clean Spin 360-degree rotation of the boat at a 0-45 degree angle retaining the feature, initiated with only one paddle stroke (clean) the paddle not being used while executing the move. Super clean Spin 360-degree rotation of the boat at a 0-45 degree angle retaining the feature, initiated with no paddle stroke (superclean), the paddle not being used while executing the move. Roundhouse 180 degree rotation around the bow of the boat, elevated 0 to 45 degrees, on green water, clear ofthe foam pile. Back Roundhouse 180 degree rotation around the stern of the boat, elevated 0 to 45 degrees, on green water, clear of the foam pile. Blunt *** or Aerial Blunt 80 degree rotation around the bow of the boat, elevated more than 45 degrees, on green water, clear of the foam pile. The boat does not touch the water at one point of the execution for air blunt. Backstab or Aerial Backstab 180 degree rotation around the stern of the boat, elevated more than 45 degrees, on green water, clear of the foam pile. The boat does not touch the water at one point of the execution for air backstab. Flip Turn or Big Mac Flip Turn: An aerial short axis rotation (tilt) of over 90 degrees (like a table-top) performed with a 45 to 90 degree long axis rotation landing in a front surf. Aerial FlipTurn or Helix *** A 360 degree spin with at least 180 degrees of which must be performed inverted at 135 degrees or more, ending in an upright front surf. The boat does not touch the water at one point of the 180 degrees spin (Helix). Pan-Am A past vertical aerial blunt, boat must go inverted and rotate 180 degrees and finish upright landing in a back surf. Back Pan-Am A past vertical aerial blunt, boat must go inverted and rotate 180 degrees and finish upright landing in a front surf. McNasty Elevated 180-degree rotation starting in back surf, linked with a front loop. Ferry for control and fun!